People are often confused by the term ‘screen print’ presuming that it is a digital or machine produced print. A screen print is an original piece of artwork, I use the term ‘print’ to describe the way I apply ink to the paper. It is a complicated and time consuming, but extremely satisfying way of making a picture. I choose to work using this process because I love the way colour can be applied to paper in huge flat blocks – or in lively patterns – the effect you get can be wonderful. I also frequently use this process in my picture books to make bold flat backgrounds for my characters to exist on. I really enjoy painting on top of printed ink and all my ‘screen prints’ are hand finished with ink and watercolour details. A silkscreen is - a wooden or aluminium frame with a fine nylon mesh stretched over it. The mesh is coated with a light sensitive emulsion or film, which - when dry - will block the holes in the mesh. The image that needs to be printed is drawn on to acetate. This acetate positive and the mesh on the screen are sandwiched together and exposed to ultra-violet light. The screen is then washed with a jet of water which washes away all the light sensitive emulsion that has not been hardened by the ultra-violet light. This leaves you with an open stencil which corresponds exactly to the image that was supplied on the acetate. Now the screen is fitted on the press and is hinged so it can be raised and lowered. The paper to be printed on to is placed in position under the screen and ink is placed on the top side of the screen, (the frame acts also as wall to contain the ink). A rubber blade gripped in a wooden or metal handle called a squeegee (not unlike a giant wind-screen wiper) is pulled across the top of the screen; it pushes the ink through the mesh onto the surface of the paper you are printing. To repeat the process the squeegee floods the screen again with a return stroke before printing the next impression. 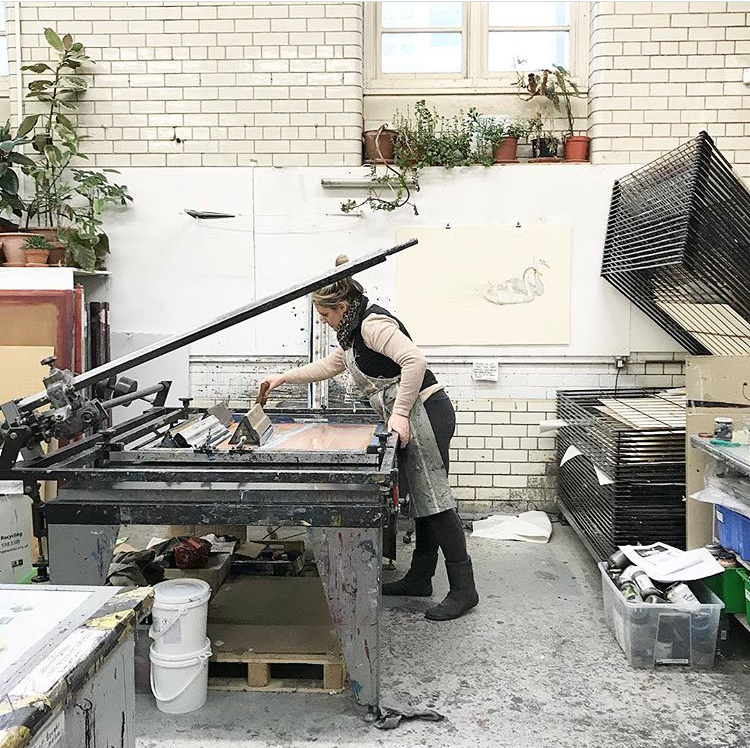 I only make very small editions of silkscreen prints, usually between 15 and 25, and my method of working ensures that every single print in an edition has unique colours and marks running through it. To do this I ‘mono print’ the first layer of each silkscreen print by painting many different colours in to the stencil before pulling the squeegee across the screen. Each print has a different base colour thus they are called ‘variable edition silkscreen prints’ or V/E for short (you’ll see that this is written on every print next to the edition number). I then print layers and layers of colour on top of this multicoloured base layer to make the image. There are usually between twenty and fifty layers in each of my silkscreen prints. After the printed ink had dried I hand paint ink and watercolour details on top to complete the picture. 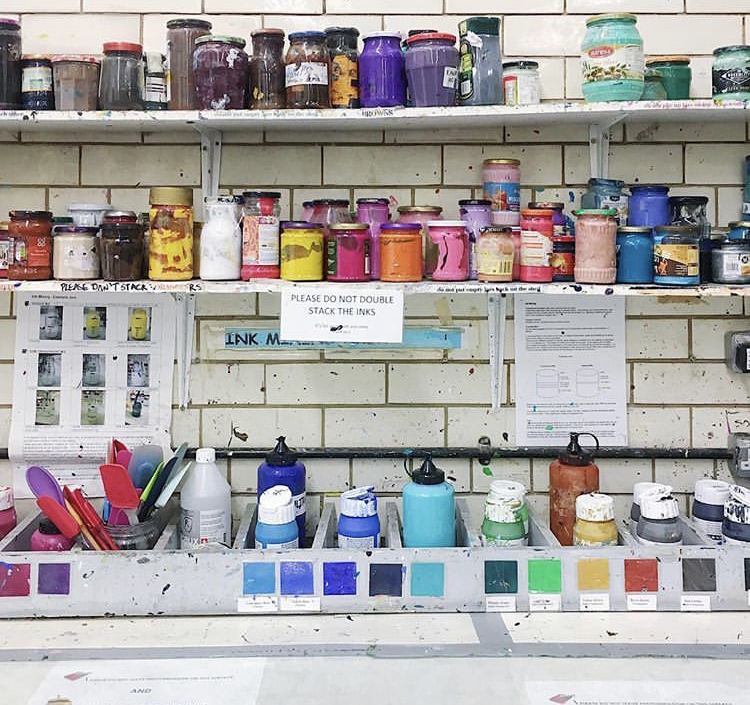 You can watch a film about the process of silk screen printing if you click here. I do all of my printmaking at Edinburgh Printmakers. You can and buy my screen prints here. So what is a Giclée ‘Print’ then? A Giclée print is completely different kind of ‘print’. It is a digital print of the highest quality which is a re-production of another piece of artwork. Usually the original artwork has been scanned first, or sometimes photographed. The Giclée printing process involves a very high tech printer squirting or spraying microscopic dots of pigment-based ink onto high quality art paper or canvas. The image is colour corrected to attain the closest possible match to the original work if required. The digital information is fine tuned to the type of paper or surface on which the image is to be printed, further ensuring fidelity to the original. I have searched far and wide to find a Giclée printer who creates the best reproductions of my original book illustrations. My editions are limited to 250 and each one is signed and numbered. You can buy my limited edition Giclée prints here.